This month, September, is World Alzheimer’s Month. The organization, Alzheimer’s Disease International, uses this month to raise awareness on the prevalent condition worldwide. 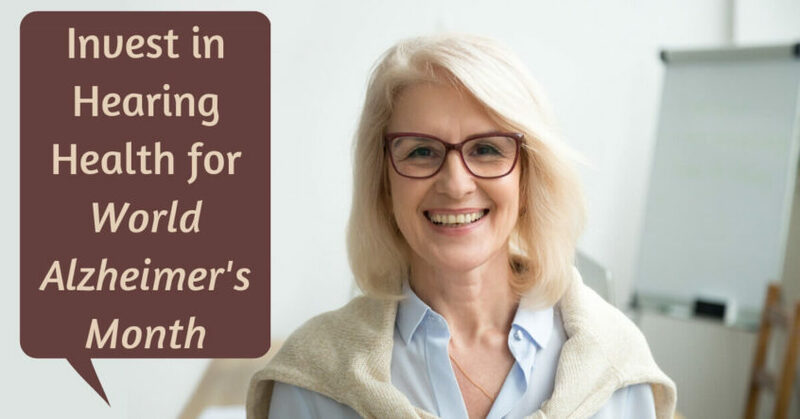 At Hearing Aid Associates, we would like to participate in raising awareness for dementia and Alzheimer’s disease by connecting these conditions to hearing loss. Alzheimer’s disease and dementia are often connected to old age, but the reality is, Alzheimer’s is not a normal part of aging. Alzheimer’s disease is the most common cause of dementia, which is a general term for memory loss and other cognitive abilities serious enough to interfere with everyday life. Approximately 60-80% of dementia cases are people who experience Alzheimer’s disease. As a progressive disease, Alzheimer’s does worsen over time, over a number of years. Early on, Alzheimer’s disease consists of mild memory loss. For people with late-stage Alzheimer’s disease, people lose the ability to carry on a conversation or respond to their environment. In the US, Alzheimer’s disease is the 6th leading cause of death. People diagnosed with Alzheimer’s disease live an average of eight years after their symptoms have become noticeable. While there is no current cure for Alzheimer’s disease, treatments are available. One major goal of researchers and organizations working on Alzheimer’s disease is to raise awareness and to find better ways to treat the disease and delay its onset. How are hearing loss and dementia and Alzheimer’s disease connected? The answer can be found in the brain. Sensorineural hearing loss occurs due to the natural process of aging (presbycusis) or exposure to loud noise, and it affects inner ear hair cells which are responsible for translating sound vibrations into neural signals. With hearing loss, these signals become incomplete and therefore, sounds may appear muffled or difficult to decipher. As these incomplete signals are making their way to our brains, our cognitive abilities must work in overdrive to piece the signals together. Studies from Johns Hopkins University have also contributed a major body of knowledge on the correlation between untreated hearing loss and dementia. In one study, Dr. Frank Link and his team tracked 2,000 older adults with the average age of 77 for six years. They found that 24% of test subjects were more likely to have diminished cognitive decline compared with subjects with normal hearing. In another set of studies, Dr. Lin and his team tested 639 subjects over 12 to 18 years and found that people with moderate hearing loss at the start of the study had three times the risk of developing dementia than people with normal hearing. Researchers noted that people who treated their hearing loss with the use of hearing aids showed less risk for developing dementia. Treating hearing loss with hearing aids is one of the best ways to support your cognitive function, which in turn could help reduce the risk for developing dementia. A simple, quick hearing test is all it takes! If a hearing loss is detected, our team at Hearing Aid Associates will work with you to find the best solution to meet your hearing needs. In honor of World Alzheimer’s Month, contact us at Hearing Aid Associates for a hearing test and invest in your hearing health!